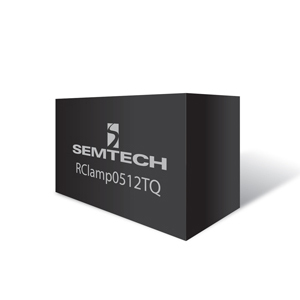 The RClamp0512TQ is specifically designed to provide secondary surge and ESD protection on high-speed data ports. The RClamp0512TQ integrates low capacitance, surge-rated steering diodes with a high power transient voltage suppressor (TVS). 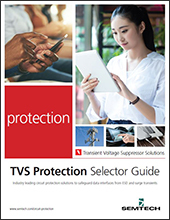 The TVS utilizes snap-back technology to minimize device clamping voltage and features high surge current capability of 20A (tp=8/20us) while only presenting 2pF typical in a line-to-ground configuration. RClamp0512TQTNT: Pb-Free, Halogen Free, RoHS/WEEE Compliant, 10,000 pcs. RClamp0512TQTCT: Pb-Free, Halogen Free, RoHS/WEEE Compliant, 3,000 pcs.